by admin | September 30, 2011 | Misc. Why is Magento the best e-commerce software for SEO? If you want to run a business online, it’s more than just selling products. You’ll have to think about “how” your customers are going to find your products. This is where good built-in SEO (Search Engine Optimisation) and marketing tools are vital. The top reason to choose Magento would be its search engine friendly URL feature. This feature allows store owners to customise the URL (web address) of each and every page on the website. These links are beneficial because you can custom-build your URL to specify the product, even if there is only a picture of it on the page. Additionally, having search engine friendly URL’s helps SEO agencies to built great campaigns. So, if your trying to get a good Google ranking for “dining room chairs”, the URL will aide in SEO and conversion optimisation. 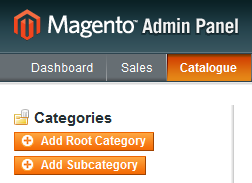 All the categories (known in the backend as Parent Categories) which you will create in Magento have potential subcategories (known in the backend as Children Categories). For example, if you run a furniture store and have “Dining Room Furniture” as a category, you can have “Dining Room Tables” as the subcategory and below this subcategory a list of all your products. All products can belong to more than one category or subcategory. Your URL would then look something like this: Homepage: www.yoursite.com/ Dining Room: www.yoursite.com/dining-room-furniture.html Dining Room Chairs: www.yoursite.com/dining-room-furniture/chairs.html Dining Room Product Page: www.yoursite.com/dining-room-furniture/chairs/lumbar-support.html In turn, you might have the lumbar-support chair available in both living room and dining room categories, in which case the user can find the lumbar support chair in two Magento categories: www.yoursite.com/dining-room-furniture/chairs/lumbar-support.html www.yoursite.com/living-room-furniture/chairs/lumbar-support.html So whether you are looking for “chairs”, “dining room furniture”, “lumbar support chairs” or “living room chairs” there are several possibilities for your customer to reach that particular item. Sitemaps are an easy way for webmasters to inform search engines about pages on their sites that are available for crawling. Magento allows users to enable such a sitemap which will help you get indexed faster so that people can find your products easier. You can read about creating Google sitemaps for Magento on the Magento website. Magento has another feature that helps with SEO and conversion optimisation, the site’s search bar. You can see the most popular products on your website’s internal search bar so that you and your web designer can optimise traffic in the most popular pages. More of a marketing tool, a potential conversion improver with Magento is the ability to see the most viewed products from the backend. By knowing which products you sell the most, you can target those pages to new customers, via online marketing techniques, Google Adwords or directly on your website. This not only allows you to focus on your niche online but supports you to apply the 80/20 rule to your business – find the vital few and make those products easy for your customers to find. 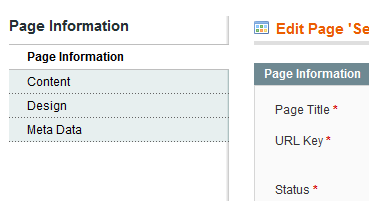 The CMS section of Magento is the place where you can upload content. Most of our clients use it for news or media. This gives you the chance to write about your products, company, or anything else that clients should know about a store website. It also includes keywords and meta title and description. A static block is a Magento custom variable which allows the site’s administrator to add and control chunks of HTML or content that can be displayed throughout the website. This is perfect for seasonal banners, sales, footer links a store map and anything else that serves as relevant content to your site. 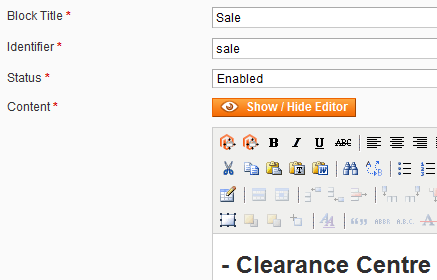 Magento includes a WYSIWIG editor, much like WordPress. What do you think of these Magento SEO Features? Leave a comment.